We have very few stores in our area and the ones we have are small which means their stock is small, too. Finding things on clearance is not easy and it usually clears out quickly even at 50% off. When I see images of clearance sales elsewhere I am shocked that there is more on clearance at those stores than my store ever had of the items to begin with. So after Christmas Clearance Shopping is not one of our biggest Operation Christmas Child shoebox stockpile shopping times of the year like it is for so many others. But Sarah went hunting, as always, hoping to find something for our shoe boxes. I hope to add decorations to the inside of all of my Operation Christmas Child shoebox gifts this year. Calendars work perfectly for this so I made this collection poster to share in hopes of being able to get some from friends and family members. I'm sharing it here in case anyone else wants to print it to hang up or share the image on their social media sites and collect calendars of their own. 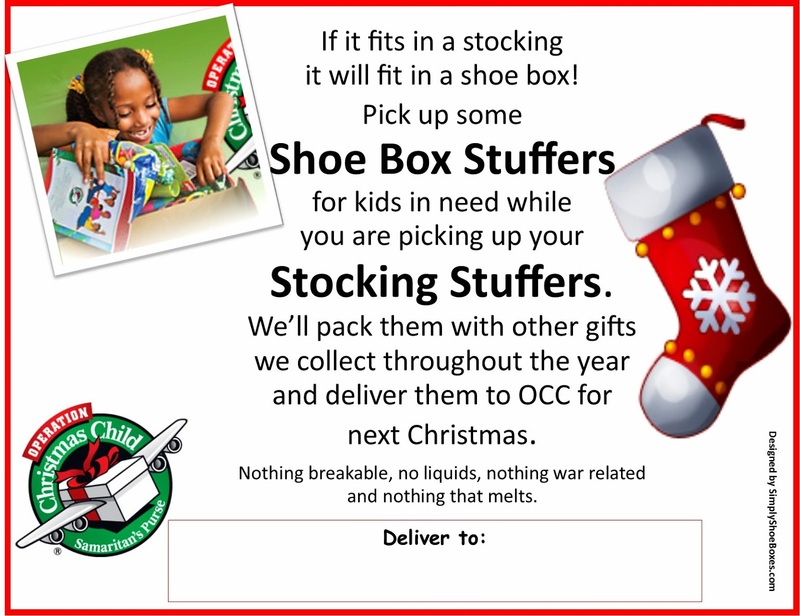 You can find more Operation Christmas Child shoebox supply collection posters thru this link: Shoebox Printable Resources. If you like upcycling you may enjoy our Upcycling Crafts for Operation Christmas Child Shoeboxes Series. I had the pleasure of ordering fabric for an Operation Christmas Child shoebox project once again from my friend's online store. She donated the fabric & trim for the skirt and the yarn for the hat. Christmas Gifts Received for My Operation Christmas Child Shoebox Stockpile ~ And A Big Surprise! I let my family know that I would love to receive gifts for Christmas that I could pass on to a needy child thru Operation Christmas Child shoebox gifts. I received some fun things for sure! I had a great CVS deal shopping trip for Operation Christmas Child shoeboxes this week. I had a $5 off $15 total order coupon I received in an email from CVS. I knew that if I combined it with the Spend $10 on CVS Oral Care get $10 Extra Bucks I could get some free stock for my shoe boxes. My daughter Sarah, from Simply CVS, does my shopping for me. I just told her to find some deals for my shoeboxes. After getting the toothbrushes she decided the Bandaids @ $3.49 get $2.50 back would be a good addition (I see a Dora themed box in my future). 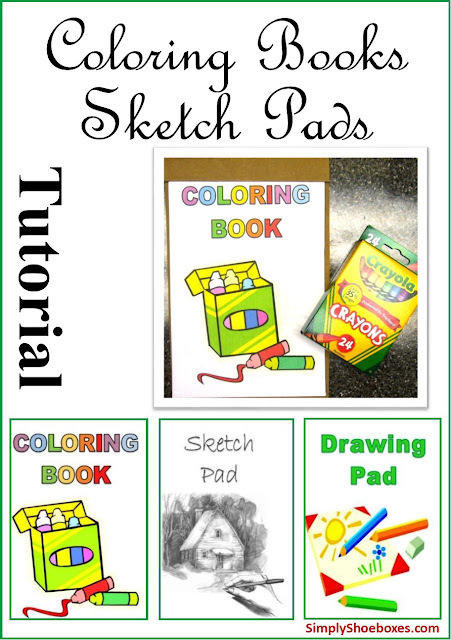 She still needed about $1 more to reach the $15.00 so she got the small memo book for 99 cents. Because we have several shoppers on our Operation Christmas Child shoebox team we need a way to keep track of our purchases. By using Google Documents we can all access and update it when we get more shoe box items. It can also be brought up on a phone in the store before a purchase is made to be sure we don't over buy certain items. Updates automatically each time a number is added in lower line. Shopper records date/name/specifics & number. Each category has its own page. As the year proceeds if we are close to our goal for 100 boxes in all categories I will go in and increase the number needed on line 3 and we will keep shopping. I am hoping this system keeps us from having 200 stuffed animals and only 50 toothbrushes when it comes time to pack. It is also to help us not to overbuy when we find a great deal. I'll let you know how it works out. Meanwhile, if you missed my earlier posts on how we are organizing our purchases you may want to check them out here: My Shoe Box Stockpile Organization. I haven't been sharing my Operation Christmas Child shoebox shopping much but will try to get in the habit so you can see the fun goodies I am adding to my stockpile. This week my additions were from Toys R Us and CVS. She purchased these two packs of toothbrushes -- one at $5.99 and one at $4.59 for a total of $10.58. The coupon took off $3.70 leaving a $6.88 balance which she paid for with extra bucks from earlier weeks of shopping and I received a $6.00 extra buck back. My "net cost" after coupon and extra bucks was just $.88 or $.22 per brush--a 92% savings over retail. I used to get all of my toothbrushes free with CVS deals, but that is hard to do now, so I aim for $.25 each. I was excited to get these four. I have some travel covers that were free with personal toothbrushes in the past so I can open these packages and use those to keep them clean and split them between boxes. I may put the whole package in one so the child can share. I won a $125 Toys R Us gift card from a blog giveaway. I won it back in August but just received it this week. We do not have a store nearby so my daughter and I went shopping online. I am so excited to be able to put such high quality items in my boxes. We've only spent $50 so far, enough to qualify for free shipping. We picked out clearance and sale priced toys so the card can go further. They have been shipped in three different shipments, but I received my two dolls yesterday. Chloe & Kylie, Victorian Sweet Lollies Dolls for Operation Christmas Child shoe boxes. I love dolls and usually don't have them to put in my shoe boxes because I get stuffed animals at better prices. But this year I want to work hard at getting some dolls so when I won the gift card I just had to look over the dolls. I found these 13.5" Victorian Sweet Lollies, regularly $12.99 on sale for $6.98. So I splurged and "spent" $14 of my gift card on them--but really they were FREE. They are very narrow and their legs fold right over their bodies--they will fit perfectly in an Operation Christmas Child shoebox! I will be making some skirts or dresses for them to match the ones I will make for the little girl receiving the box. Maybe an apron, too, and sleeping bags, and..... What fun we will have! Check out this post if you are interested in knowing Why We Include a Stuffed Animal in Each of Our Operation Christmas Child Shoeboxes. Or a doll to love, but we often include a smaller stuffed animal with the doll. I shared earlier how I am trying to find simple ways to involve my elderly mother in our Operation Christmas Child shoebox packing. She is easily confused, which makes even the simplest project a challenge, yet she gets such fulfillment out of helping. She not only feels she is helping the child, but she also feels she is helping me. After posting a "WANTED: Empty Shoe Boxes" poster at work my husband received a few inquiries as to how to pack a box. He took in brochures to give to those interested. He also provided the drop off location times so they could either drop them off themselves or bring them to him and we would take them. but I loved the detail she put into wrapping these. Maybe the checker will put them back on and they can be taped over; I like to think they will. One day a fellow worker brought these two in that his wife had packed. I could not believe how heavy they each were! And she had taken the time to decorate them so lovely. At times I miss the days of packing one or two extra special boxes. That's why this year I am not setting a total number goal but trying to pack many while packing them each as unique as possible. I enjoyed seeing these done up so lovingly and filled with wonderful items. They reminded me of the premise of Operation Christmas Child: one box from one family/person to one child. Tho many of us pack in multiples, we can still make them individual in some way--just as the child receiving it is. My friend collects shoebox items for Operation Christmas Child year round at her small business. I often make her signs to share on her Facebook page and to print and post in the store. Here is my latest. I wanted to share it in case any of you can use it in any way for your own collections. I thought it was a good time to share how stuffing shoe boxes is much like stuffing stockings and while we pick up our stocking stuffers we can pick up shoebox stuffers. You are welcome to print or use the image online. 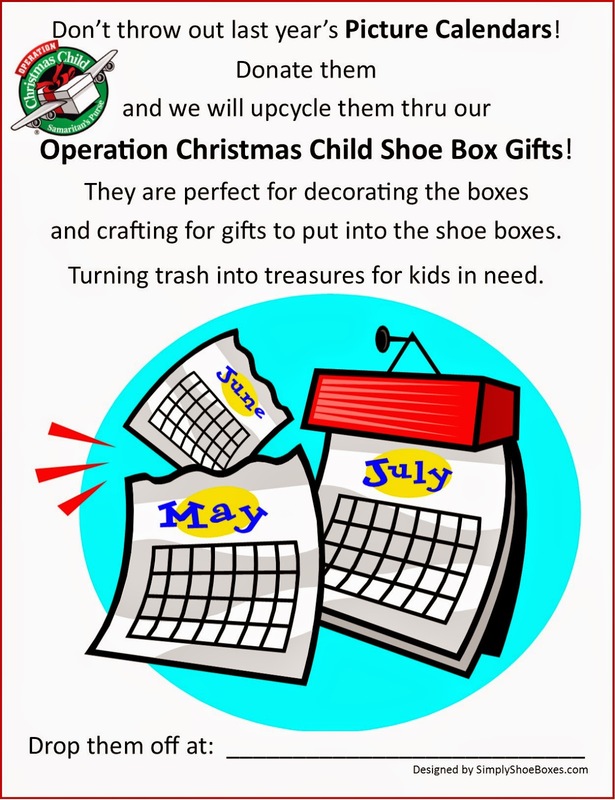 You can find more shoe box supply collection posters thru this link: Operation Christmas Child Shoebox Printable Resources. My friend runs a brick and mortar discount craft store. She recently opened an online store, The Rag Bag of Shelby [Updated: no longer in business], and donated fabric for me to make a dress for one of my shoe boxes. I got to "shop for free" at her online store. 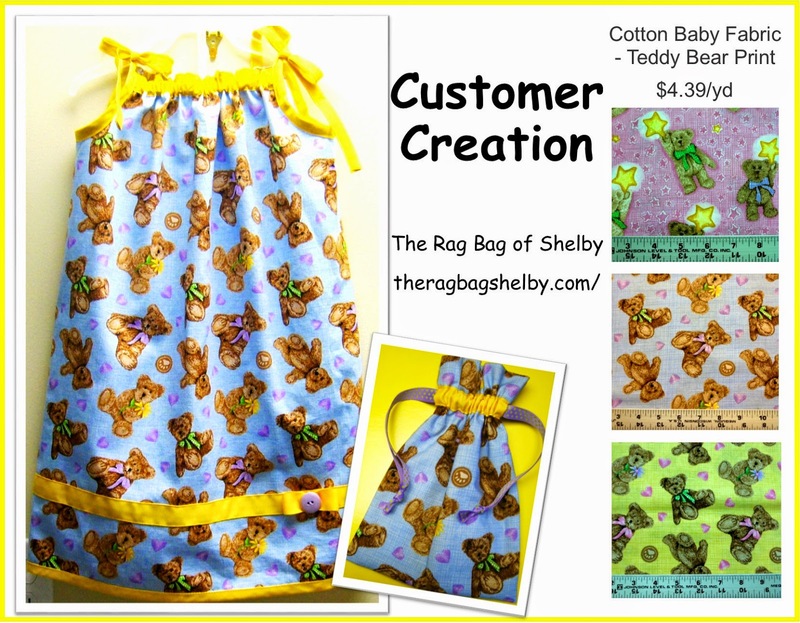 I chose this sweet cotton fabric Teddy Bear print--it is a Boyd Bears print. It so soft to the touch. So I began to build my first shoebox for the 2015 Operation Christmas Child collection around this dress.